What has happened so far in the trade war? The Shanghai International Import Expo is China's big attempt to show the world - and especially the US - that its economy is opening up more. The week-long event aims to give a multi-billion dollar boost to imports. Thousands of foreign firms are here. He also didn't address the core US complaints about Chinese trade, including the alleged theft of intellectual property from US firms and the special terms China gives to its state run companies. There was definitely no sign that China is about to cave in the escalating trade war. 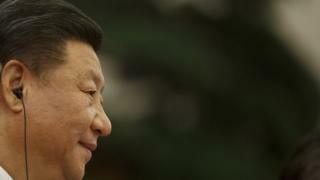 Mr Xi said the Chinese economy was "a sea". Storms can overturn a pond, he said, but never a sea. The White House says the tariffs are a response to China's "unfair" trade policies, which Mr Trump blames for helping to create a huge trade deficit, and its alleged intellectual property theft. He did not make clear which countries' imports would benefit from the lower tariffs, and whether the US was on this list. "China's door will never be closed, it will only open still wider."